Down in our downstairs toy room I just had a HUGE toy box. Now I have small individual totes with labels (puzzles, cars/transportation). I only allow one tote out at time. This cuts down on clutter, tripping over toys and constant clean-up. So on WFMW- I am suggesting individual toy totes. 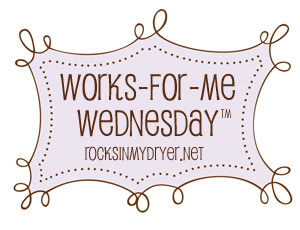 For other helpful tips and great ideas go to Rocks In My Dryer.